The cost to lower a basement varies depending on numerous factors such as size of basement, type of foundation, depth of excavation, type of soil, condition of existing foundation, age of house, number of support columns to be lowered, location/feasibility of relocating water supply, sewage lines, floor drainage, weeping tile, etc. 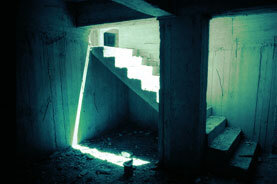 The typical cost to lower a basement ranges from $50 to $100 per square foot. Contact us using our email form or call toll free 1-888-610-4959 if you are considering having your basement floor lowered. Many basements of older homes within the older areas of Caledon are not high enough to walk around comfortably. - In many of these century homes and pre 1930 homes the basement was often referred to as the 'cellar' and was used as a utility space where such items as the furnace, (coal storage / oil tank storage), water heater and electrical panel were located. With proper engineering and modern construction and waterproofing technologies it is possible to convert the basement of your Caledon home into livable space by lowering the basement floor and waterproofing the foundation. If you live in Caledon and you are considering having your basement lowered to increase the basement ceiling height and gain some additional living space? Are you avoiding remodeling and finishing your basement of your Caledon house because the ceiling height is too low or the floors are buckled and cracked and the walls are damp or have water leaks? If you are looking to add space to your Caledon home, lowering the basement to add additional ceiling height may be the solution. You might be surprised how much space can be created when finishing a basement by lowering the basement floor and the base level of the foundation by means of foundation underpinning or bench-ledging. Make your basement a useful, livable space that adds value to your home now and when it's time to sell. IMPORTANT: If basement lowering is not done correctly, the basement excavation could damage or undermine the foundation and lead to a collapse of your home. Additionally, the City of Caledon requires a Building Permit for the basement lowering and excavation project. - The permit application will require engineering drawings to be submitted. Therefore, a Caledon basement dig out must be done by a professional basement lowering contractor that is knowledgeable, licenced, equipped and experienced. - that's where we come in! Cochren Foundation has over 40+ years of foundation construction and engineering experience. We specialize in aspects of basement lowering in Caledon, foundation underpinning in Caledon, foundation repair and foundation waterproofing projects. We work with you every step of the way to ensure that your Caledon basement lowering project is completed on time, and on budget and with excellent quality results! Contact us using our contact form or call us toll free at 1-888-610-4959 today for an estimate and get your Caledon basement lowering project underway with proven professionals whom you can trust and rely on! Basement lowering by digging out the basement and excavating is a multi-stage project and a major renovation for any home. Contract with the experts at Cochren Foundation to complete your basement floor lowering project. We employee only the most experienced engineers and foundation contractors. Our company have over 40 years of construction expertise. We are experienced with all stages of the Caledon basement dig out / basement excavation project. 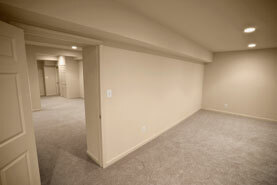 Click here to contact us or call 1-888-610-4959 today for a basement lowering estimate. Before the existing basement floor can be lowered, the foundation must be stabilized to ensure that the basement excavation does not compromise the foundation resulting in cracks, sinking or worse ... collapse of your Caledon home. Basement Lowering, also referred to as Basement Dig Out, Dig Out Basement Floor, Basement Excavation, Basement Floor Lowering, Lowering Basement Floor, Lowering Basements, Increasing Basement Height, Digging Down a Basement, Digging Out a Basement is accomplished by underpinning the foundation or installing bench footings and removing the existing floor, excavating the basement to the new elevation and pouring a new concrete slab. Aside from stabilizing a damaged foundation, the most common reason one would underpin a foundation or constructing bench footings is to accommodate lowering the basement floor to increase the ceiling height of the basement. Foundation Underpinning involves excavating sections under the existing foundation wall to the desired depth and pouring new concrete under the existing foundation. This maximizes finished size of the lowered basement since there is no loss of horizontal space as there is with the bench footing method of basement lowering. Benching or Bench Ledging or Bench Footings - A new foundation wall is installed by digging down away from the internal wall just above the existing footings. The ledge or bench will extend into the basement reducing the finished floor space slightly. The depth of the ledge (or bench) that is created will determine the width it will extend horizontally into the basement. Typically the width of the bench footing will be equal to it's height - For every foot you go down in depth, you must add a foot in width to the bench ledging. If you are dropping the floor two feet, you will have a two-foot wide bench along the base of your new wall, which will affect the final design of your basement room. Why Cochren Foundation is the right choice for your Caledon Basement Lowering project? We'll be more the happy to answer any questions you may have about basement lowering in Caledon. Contact us today find out if basement floor lowering is suitable for your Caledon home. Use our Contact Form or call us toll free at 1-888-610-4959 today to discuss how increasing your basement height through basement lowering can add value to your home.